Like a Rookie Premiere auto from Topps Football, the Bowman AFLAC auto is a card that can have substantial value, yet at the same time is one of the more difficult modern cards to purchase due to the amount of "signed in person" and counterfeit versions. 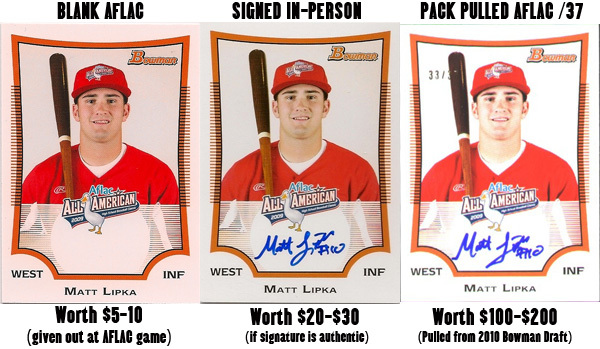 Unlike the Rookie Premiere auto which is among the most counterfeited cards on the market, the primary concern when buying an AFLAC auto pertains to the unsigned versions distributed at the AFLAC high school All-American game. Collectors often get these signed in person, which creates a confusing dynamic for buyers. Most of the time both the autograph and the card itself are authentic, the problem is that many times collectors believe they are purchasing the infinitely more valuable pack pulled version. Below is an example using Braves prospect Matt Lipka. The good thing is that AFLAC autographs pulled from 2009 and 2010 Bowman offerings feature a foil numbering on the front of the card. This makes the card easily distinguishable from the non-pack pulled versions. When buying an AFLAC autograph pulled from a pre-2009 Bowman offering, I would recommend holding out for a version that's been graded or authenticated by a respected grading house such as BGS or PSA. In addition, I would also suggest reading each seller's feedback and doing more research prior to purchase than you would for other cards. There are several extremely reputable seller's that are straight forward with sellers, but there are also some not so reputable sellers who will purchase an unsigned version, forge a signature and re-sell it as the pack pulled version. The year of an AFLAC card isn't always the same as the product it's pulled from (the year the player was an AFLAC high school All-American is the year of the card). 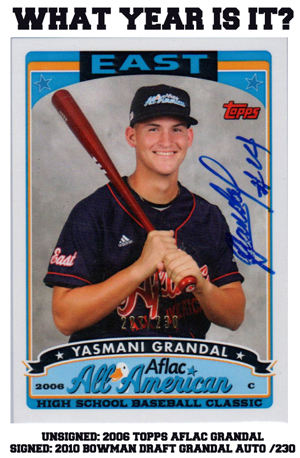 Example - Yasmani Grandal's 2010 Bowman Draft AFLAC auto /230 features a 2006 Topps AFLAC card. The year of an AFLAC autograph is determined by the product it was pulled from. Hence, an unsigned Bryce Harper AFLAC is listed as a 2009 Bowman AFLAC but his pack-pulled signed version is considered a 2010 Bowman AFLAC auto, as it was seed in 2010 Bowman Draft. Hold out for a graded/authenticated version of high-dollar AFLAC autographs that were seeded in Pre-2009 Bowman products. A perfect example is Jason Heyward's 2008 AFLAC auto (signed 2006 Topps AFLAC card), which books at $500. I've recently seen collectors pay in the low $300's for an un-graded version of this card, which is an extremely risky investment. Not only is a graded/authenticated AFLAC autograph recommended for buyers, it's also recommend for sellers. This is because buyers will bid with confidence knowing they are pursuing the real deal. The safest AFLAC autographs to buy are the foil numbered versions seeded in 2009 Bowman Draft and 2010 Bowman Draft. Some players only have signed in-person AFLAC cards such as the Twins Aaron Hicks. This is due to contractual issues Hicks has with Razor. Hicks does have a 2010 Topps Pro Debut Cuts auto, which features an autographed piece of his 2007 AFLAC card embedded in a Pro Debut card, but these aren't considered true AFLAC autographs. Each and every AFLAC auto presents a unique situation worth doing your homework on. There are numerous variables at play that don't always hold true for similar AFLAC autographs. Unsigned AFLAC cards can be extremely valuable, as Jason Heyward's unsigned 2006 Topps AFLAC card books at $150. 2006 AFLAC cards are considered to be "Topps" rather than "Bowman". However, signed versions that have been seeded in post-2006 Bowman products are refered to as Bowman AFLAC autographs. Regardless of year, a pack-pulled AFLAC autograph is listed as a "Bowman AFLAC" auto. This is because they are pulled from Bowman products. Sometimes a player will have 2 different AFLAC cards, one being the regular version and the other being a promo. The pack pulled AFLAC auto features only the regular version. Pre-2006 AFLAC cards weren't distributed commercially, they were redemptions seeded in Bowman products.